All you really need to harvest is a knife, but you may like a little cutting board. If you make notches on the ends it will sit on top of your pot and allow the cut pieces to fall in. In times of plenty, I cut the stem just below the purple color. Less stem makes for a richer dish overall. The leaves and stems just get chopped up, into roughly 1” long pieces. I always leave at least one leaf per plant, the youngest one. If there are old leaves that are past their prime, I cut them off. This picture is the corm on right above cut open long ways. Above the knife is young corm from this summer. It is fine. 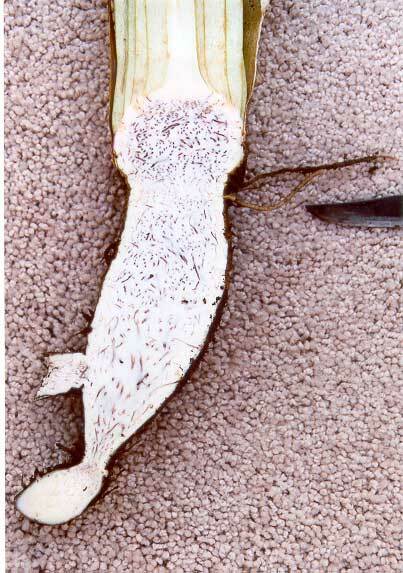 Below the knife is mature corm, probably fattened up last fall. This is the tastiest part of the corm. If I had to choose only a small amount of corm (like if you have few leaves and don’t want to overwhelm them), I would go for this part. When I first grew taro, I would harvest leaves until the whole plant started going dormant, leaving me with tons of corm and almost no leaves. I got to where I did not like corms so much. Real taro growers say go for either leaf or corm, but not both. I think the constant taking of leaves affected the corm flavor. These pictured were grown all summer with no leaf picking. They tasted fine. I still like a limited amount with the leaves, though. Peeling corms is the one time I occasionally get enough taro sap on my hands to cause an itch. If I hold the plant by the stems as I peel and slice it is fine. If I am going to handle the peeled corm in my hands, I put on those latex gloves from labs. And, failing that, I used salt. Sprinkling salt on wet hands will take the itch away. If you have “excess” corms that you think are good, here is a simple way to cook them up alone. Then a layer or more of corms, peeled and halved (or quartered if big). Sprinkle a good bit of salt on each layer of corms. A little water, like a ¼ cup. Cook in the pressure cooker, on pretty high until you sense it is drying out. (About twenty minutes. Starts smelling burnt, and doesn’t slosh when you shake it.) Turn to very low or off and let sit for 5-10 minutes. Baked whole taro corms: I am still experimenting, but having great luck with just baking for an hour at 450 degrees for a smallish potato sized corm. The corm is peeled or not, and you can leave as much of the huli on as you want to. If peeled the outside of the corm tends to dry out a little, but that is OK.
(Someday I may try individually wrapping in aluminum foil with ti leaf wrap inside of that.) The advantage of baking without peeling is easiness - heck, sometimes I don't even wash well - and it holds in moisture. The "presentation" of a dirty hairy rooted baked corm is not great, but people pick thru them OK. Baking is also a good way to test a corm of unkown quality. Pi'i ali'i and Kai kea are two varieties that are really good this way. Bun long is better cooked in the pressure cooker, as the corms get nice and moist-mushy that way. I’m not sure what the difference between my fake palusami and luau is, and I have never actually cooked luau knowingly. 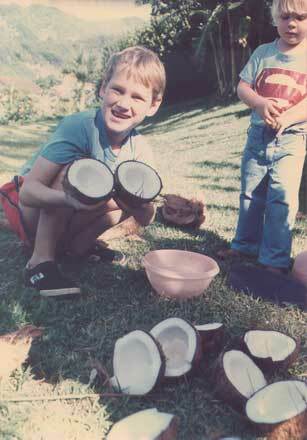 But you might run into someone who says you are making luau, so I thought I would mention it. 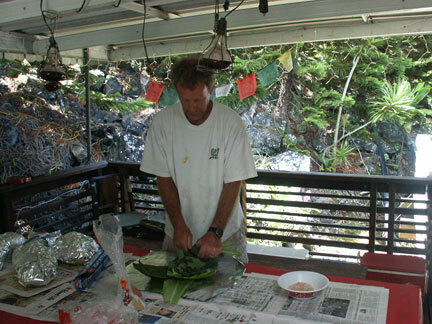 “Luau” is cooked taro leaf. (Yes, the Hawaiian feast is named for this fine leaf we are learning to grow and cook.) If you mix chicken in, it is called “chicken luau”, or “squid luau” if bits of octopus, etc. Luau is mainly soupier and finer textured than what I cook. In Iowa all of my taro leaf comes in at about the same time. It is pretty easy to freeze some for later. Chop the leaves, etc. up as usual. 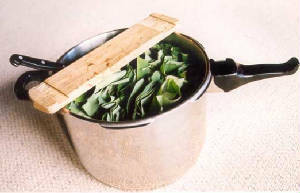 Boil for just long enough to wilt a bit. (I think this is called “parboiling”. The idea is to take up less space in the freezer.) Let it cool, then use a spoon with holes to load it into zip bags and freeze. If you lay a piece of ply or cardboard on your freezer shelf, and lay the bags flat, they will stack and store more easily. The bags in the picture hold about half a batch each. A newer trick is to completely cook it before freezing. Then it is ready-to-serve. I even write on the bag things like "great batch with tomatoes and smoked brisket". These nuke-and-eat bags disappear far quicker than the older way of parboiling where you have to drag out the pressure cooker, etc. Need helpers with your taro harvest? Just have a luau. Here are Lee, Diane, Nick and Alex, in from Nevada to help haul our giant leaves. I use a pressure cooker, as that gets hotter than just regular boiling. (I don’t think it is critical.) The only thing that is tricky with taro is the “itch”. If you eat under-cooked taro, you will get an itchy throat. For years in my early days in Hawaii I would try to cook taro leaf the way everyone says (just boil it in water), and every time it caused itching. I think the only trick I was missing is that all those old recipes also called for salt, and salt definitely takes the itch away. But high heat does, too, so I use both salt and the pressure cooker. 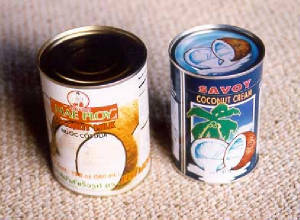 Another thing you will need (for my recipes, but taro is fine without) is coconut milk, so you might want to get a few cans ahead of time. There are many brands and prices. The cheaper ones are generally more watery (less total fat per can), but fine. Back to harvesting taro. Generally you will be using three parts of the plant, the leaves, the stems, and the roots. It’s “all good”, but there are some minor considerations. The leaves and stem go together. The lowest I usually cut a stem is at the top of the “V” where the next leaf comes out. One of the advantages of growing taro in the “bunch” method (we’ll get to that later) is that the harvest tends to be a few whole plants. That way you get a little corm each time, which is a nice flavor addition. Now let’s look at selecting the good parts of the corm. The only “bad” corm is kinda rotten and you can usually see and smell it. You usually only get it like that if growing “wetland”, and if the corm was deep in some mud with no oxygen. Cook in pressure cooker on fairly high for about 30 minutes. That’s it! This will feed a half dozen people. Everything else is just bonus land. Typically in Hawaii I double this, to feed all the hungry surfers and have a little leftover. Corms and stems, of course. If I don’t have corms, sometimes I add a potato or two, quartered. They are good, but dilute things a bit. In Iowa in the fall I add a fat phat tomato or two, chopped up. Delish. Ditto green onions, esp. 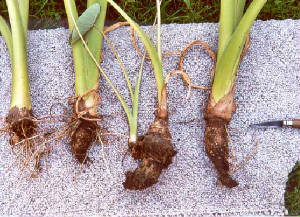 the "Tokyo neggi" type (planted deep, so there is a foot or so of the blanched white part below the dirt). Buying taro leaf in stores in Hawaii. You can get taro leaves, usually in one pound bags, in most produce departments now. They are all good, but you can be picky if you like. The best ones have the biggest stems near the leaf. Big stems mean they are harvesting at the growth peak, not later in the long semi-dormant period when all you get is small leaves. “Near the stem” means you aren’t getting faked out by a super long stem that just means more stem, not a big leaf. For the recipes above, the ratio I use is one bag of leaves to one can of coconut to one tsp of salt. I just chop up the whole bag of leaves – no wash, no cutting the stem ends off, etc. My buying situation: For the last few years 90% of the taro leaf I’ve been serving in Hawaii has been store bought. Many weeks that is 3X a week, 2 bags each. Just recently I am getting more self-sufficient. 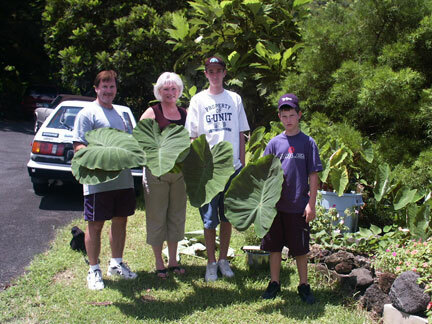 One of the reasons I first started growing taro was that was the only way to get the leaves. You could buy poi and corms, but generally not leaves, at least not in regular retail stores. I assume you know taco meat is just cheap hamburger fried up with onions, salt, pepper, and tons of chili powder. Here are 2 tricks if you are making large batches. Grease strainer: The problem with a huge frying pan full of cheap hamburger is all the grease. 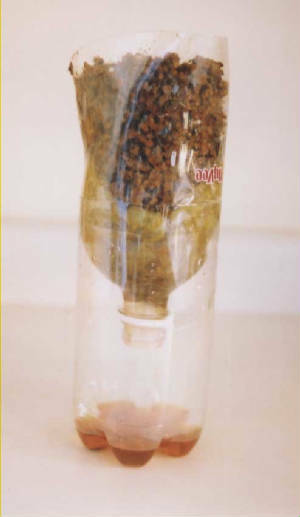 You can make a free disposable strainer out of 2 pop bottles. 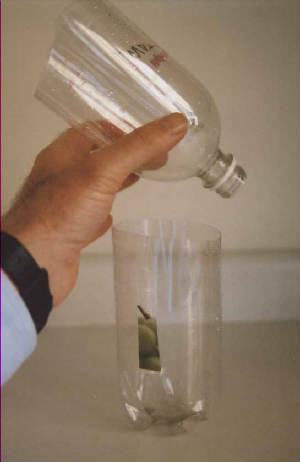 Cut the top one like a funnel (cut the bottom of bottle off), and put a napkin in. Cut the bottom one like a cup, to receive the grease drippings from the funnel. Afterwards put the drippings in the fridge to solidify, then toss into trash. 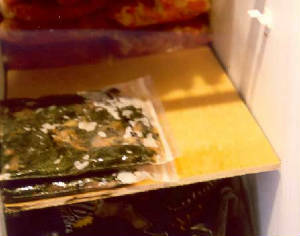 Freezer storage: After the meat has cooled, put about a cup or so in Ziplock bags and freeze. Handy for next time you do taro or want some tacos. 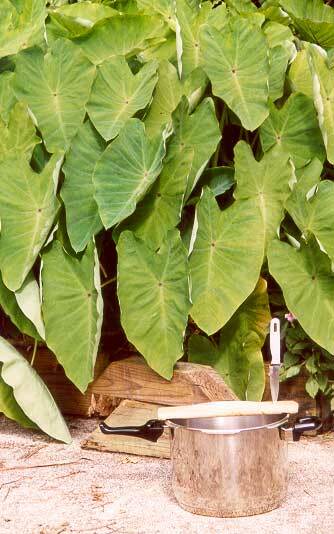 If you have an imu all fired up for your luau, you can make some bundles with taro leaf and a little salt. More on luaus later, but quickly a bundle is made with ti leaves (with the stiff mid-rib removed) and a piece of aluminum foil. Add a generous amount of salt as it will be steaming for a few hours. Here we are using the same mix used for the meat bundles, ½ red “alae” salt, ½ rock sea salt. If you have coconut cream, add a dab and you have, I think, real palusami. Either way taro leaf from the imu is extra delicious. Quick side trip to life cycle of taro from the Univ. of Queensland.